Get creative this Father's day with a DIY craft from Baby Lock. 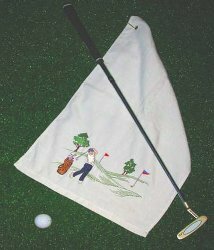 Make that special guy in your life his very own golf towels. He loves the sport so now he can think of you while playing the sport. This is a beginner project that uses Baby Lock supplies. Set up the machine with the embroidery unit attached, 40 wt. embroidery thread in the needle. Use a fabric marker to mark the location for the embroidery on the towel. Hoop the stabilizer in the large embroidery hoop. Lightly spray the stabilizer with the machine embroidery spray adhesive. Using the inside bottom edge of the hoop for placement, align the lower edge of the towel along the edge of the hoop, sticking it to the stabilizer. Lightly mist a piece of Aqua Melt Topping and place it on top of the area of the towel where the design will be embroidered. Select the golf design from the exclusives section of the machine’s built-in designs. Use the arrow keys to move the design up or down. Embroider the design using the suggested colors or your own color preference. Remove the towel from the hoop. Remove excess stabilizer and markings. To attach the grommet, mark the location at the top corner opposite the embroidery design. A grommet has two sides, a larger side with a shank and a smaller flat piece. Use the tip of your scissors to cut a small hole large enough for the center shank to fit through. Place the shank through from the right side of the fabric. Turn the item over onto a hard surface. Note: Do not do this on a surface that easily damaged as you will be hammering the grommet together. Place the flat side of the grommet over the shank, position the setting tool according to the manufacturer’s directions, and then hit it firmly with a hammer. Hook the curtain hook through the grommet and attach to your golf bag.